For all you fish lovers who love a tangy hot and flavourful fish curry here is a traditional mangalorean feast for those tastebuds. 1. Roast step 1 masala ingredients seperately and then grind along with Step 2 masala ingredients to a fine paste with just enough water to grind. Remove the masala and keep aside. Rinse the mixie/ grinding stone with 1 and a half cups of water to get masala water to be used to make gravy. 2. In a kadai heat 2 tsp coconut oil, add the slicings, 1 sprig curry leaves and fry for 3-4 mins on medium heat, then add ground masala and fry for 3-4 mins. Add the tomato concentrate, fry 1min. Add a cup and half of masala water and bring to boil, check seasoning, add the fish slices and cook till done ( approx 7-10 mins on medium heat). Check sourness, add 1/2 tsp vinegar if required. 3. 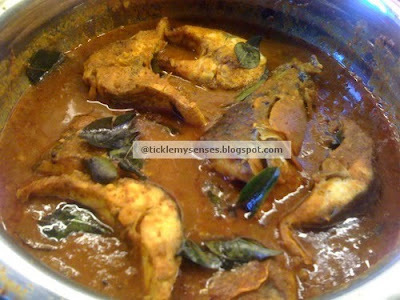 Take 2 tsps coconut oil in a pan add a sprig curry leaves,and 2 pinches of hing, add to the fish curry. Yummy hot and sour Fish Curry is ready. Serve with boiled matta rice.